Postmaster Gerrie Barnett Cambell meets Monday, April 6 with East Village Association members to give an update on a planned move of the Wicker Park post office. Plans to move the 60622 post office from 1635 W. Division will be discussed at 7 p.m. Monday at the Happy Village Tavern, at Thomas and Wolcott. Options may include separate retail and operational stations. The postal update is rescheduled from March. Previous stationmaster Carlos Johnson told EVA two years ago that finding a larger space was a priority in efforts to improve mail delivery. 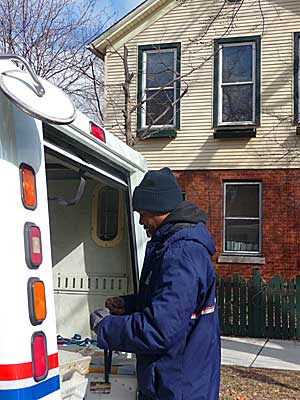 Service concerns have been a hot topic even before that year, when a postal audit gave Chicago low grades for overnight mail delivery and the postmaster general called the city's delivery service the worst in the nation. Since then, a new 60642 ZIP code was carved out east of Ashland Avenue (still served by the Wicker Park office) and a 1st Ward Customer Advisory Council was set up. (Its website indicates no meetings since last June).